Amongst the General Data Protection Regulation’s (GDPR) first casualties, Klout stands out for the lack of sorrow at its demise. The premise was simple enough: distilling users presence across multiple social media platforms to give a single score. The (almost always) two digit number bears an eerie resemblance to the rather vague and sensationalist descriptions of China’s social credit scheme, Sesame Credit – albeit several years ahead of the Communist Party’s alleged plans. The premise was flawed for several reasons. For one, there were concerns about the ethics of an opaque system for measuring social media influence, not least one boiling users’ influence down to a couple of numbers. Secondly, and perhaps more pressingly, Klout’s model was (for want of a better word), useless. Rather than showing anything meaningful about social media influencers, it did little more than aggregate scores (often woefully poorly). When a social media score did little more than Even worse were its descriptions of influencers areas of specialism: as The Drum pointed out, Klout’s view of Pope Francis portrayed him as both an expert theologian and a leader on Marxism, warfare, and Miss Universe. Such profiles did not fill the world of marketing and PR with great hope for Klout, which is winding down on May 25th (the same day as GDPR). Whilst the regulations undoubtedly played a role in the downfall of Klout (a service which almost certainly didn’t play by regulations in terms of data collection and processing), its failure to make a meaningful service was almost certainly at its core. That’s not to say that studying influencers is worthless for marketers, journalists, and communication professionals – just that smarter ways of studying influence are necessary. One of these comes from Cronycle’s service. In addition to using Twitter data and network analysis to produce our Insight Reports. 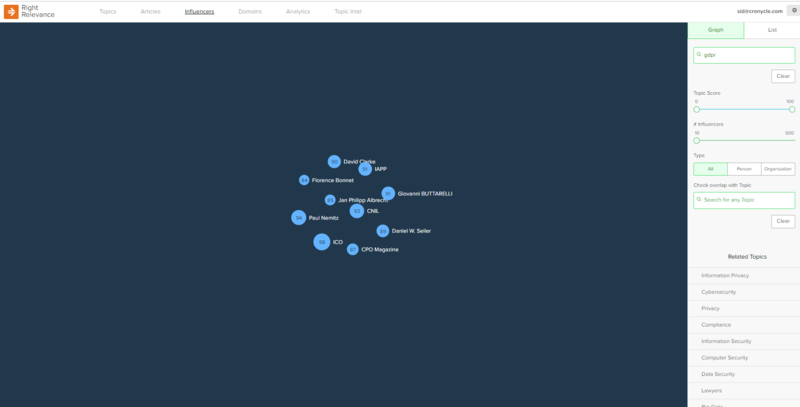 Cronycle keeps tabs on influencers across multiple topics through our Right Relevance platform across dozens of topics. Rather than giving users a single score, they receive scores for individual topics and sub-topics – this more granular approach is more valuable since it allows users to narrow down on the specific expert or influencer they want. It also builds up links with related influencers, creating networks which reflect underlying similarities and ties. An image of top influencers on the topic of GDPR. The sliders on the right allow for users to narrow down on the group they are particularly interested in. The service extends beyond Klout’s focus on numbers, though. 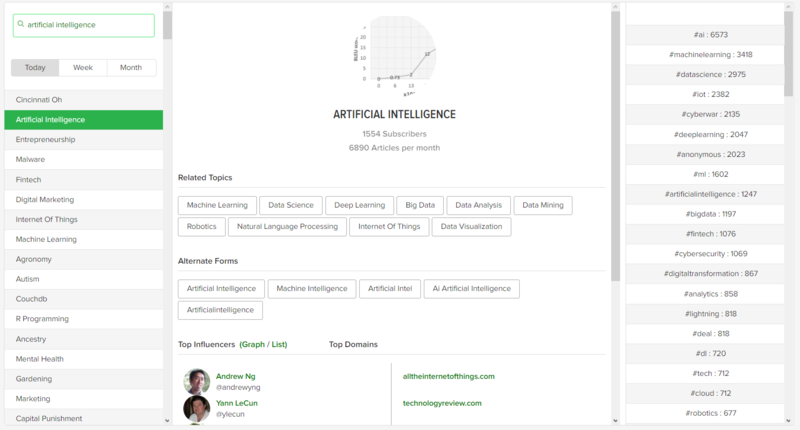 At the broader end of the scale, Croncyle’s service gives a dashboard allowing you to search through topics, compare trending hashtags, look at the top influencers and domains, and see related topics. Cronycle users can also search through articles by top influencers on their areas of speciality (as well as through related topics), giving both the tweets by the influencers and their articles. Domain searches are another feature, giving a list of top topics and top influencers for specific sites. The final aspect is Topic Intel, which allows users to compare a single subject across time – an equally important comparison to that between different subjects. Users can easily find how the top spots have changed – or not – for their subjects, as sorted by retweets or mentions (all Twitter activity). 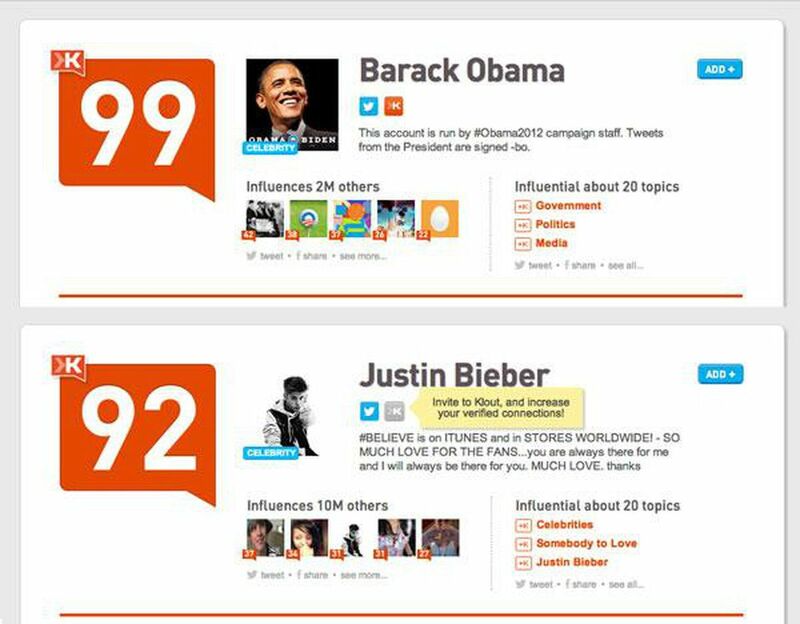 Klout may be dying, but the influencer model is by no means moribund. Holistic approaches, like Cronycle’s, build on Klout’s work of showing influence through a numeric system but seriously ramping up the extra information required to make that useful.